Lucifer's Friend are remembered with some fondness in their native England, something between legends and pioneers. Many consider their first self-titled as seminal proto-metal, and album that influenced everything from the development of doom metal to the New Wave of British Heavy Metal. Thanks to years of prodding by fans, the band has reassembled to do some touring and record new material. The first result is Awakening. The album is a two CD package, one of remastered original recordings, the other four new songs. The compilation consists ten tracks from their several studio recordings and chosen mostly by the fans. The weight fall's on that self-titled debut with four songs. Which is good, because it's the only album I remember, passed on to me probably four years after it's release. 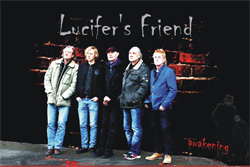 Here Lucifer's Friend sounds like a curious combination of Deep Purple and Uriah Heep. My favorite track of all must be Ride The Sky, if only for the muted French horn in the background. Watch the video below to see how it was done. In the following studio recordings the band began to experiment with everything from progressive to psychedelic to classic rock, even invoking, according to some, jazz fusion. To this, you can listen to the additional recordings and make your own determination. 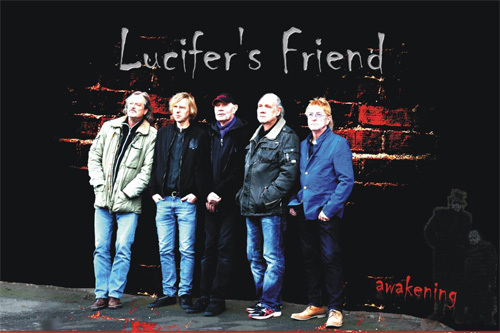 To my ears, I think Lucifer's Friend probably sounds more like Seventies progressive, mildly psychedelic, rock. Fundamentally, the compilation gives you a good taste of the breadth of their early years. As for the four new songs, they sound like the band merely picked up where they left off, that is before vocalist John Lawton left the band for Uriah Heep. The likeness to the early Lucifer's Friend sound is quite uncanny. Again, it's not so much that early proto-metal, more that melodic heavy psych rock, maybe even with some more groove. Definitely within Did You Ever and This Road. Fundamentally, it's a good return to form for the band and will likely satisfy their longtime fans. Otherwise, this will probably sound old and out-dated for those under 30 years of age. 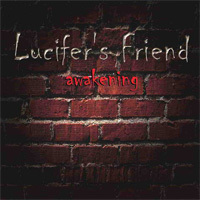 Awakening offers a compilation of ten songs from Lucifer's Friend's early recording, making for a good introduction to the band. A second CD offers four new songs which will probably only whet the appetite of fans for more.